Super Savings Item! Save 39% on the Humixx Magnetic Phone Holder for Car, 360° Adjustable Air Vent Cellphone Car Mount Holder for iPhone 8 8 Plus 7 7 Plus,Samsung S7 S8, HTC, LG, ZTE [Easy Clamping Series] (Black) by Humixx at Got Busted Mobile. MPN: HX-CP-ZJ-BK-UK-FBA. Hurry! Limited time offer. Offer valid only while supplies last. 【MODEST MAGNETIC】Thanks of four neodymium magnets, your phone can be hold steadily even on bumpy roads, but no so hard to remove when needed. 【ADJUSTABLE ANGLE】Easy to adjust the angle of your phone to get a most comfortable viewing of the screen while the holder come with a metal ball in the middle. 【STURDY AND DURABLE】This mount is made of aviation grade aluminum alloy and high density silicone. So it has a long service life and is easy to install or remove with one hand. 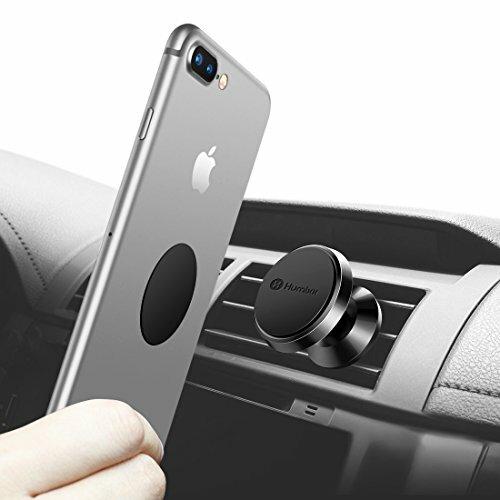 【COMPATIBILITY】Humixx car cellphone mount can compatible with most majority bands of smartphone, such as iPhone 7/7 Plus, iPhone 6s/6s Plus, iPhone 6/6 Plus, Samsung Galaxy S8 S7 S6, Note 5/4/3, HTC ONE, LG, Sony Xperia, Google Nexus Pixel and other phones and tablets. 【WARRANTY】We offer 180-day limited product guarantee. Please feel free to contact us while you get issue with the case. We will certainly do it to your satisfaction. If you want more metal plates for more phone, please search it in Humixx store.